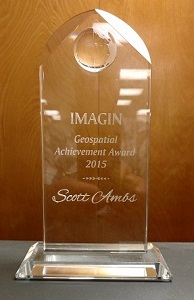 IMAGIN annually recognizes GIS professionals that have contributed to the exceptional utilization of GIS in the State of Michigan. The awards are given to GIS practitioners and/or organizations that exemplify how GIS can be used to create efficiencies in work processes, increase awareness of spatial conditions, or improve services for the citizens of the State. IMAGIN's awards are presented at the Annual Conference as part of the IMAGIN Awards Luncheon. Four (4) award categories are currently awarded and additional information on each award can be found following the links below.